It’s farm share season, and in early summer, that means spinach! 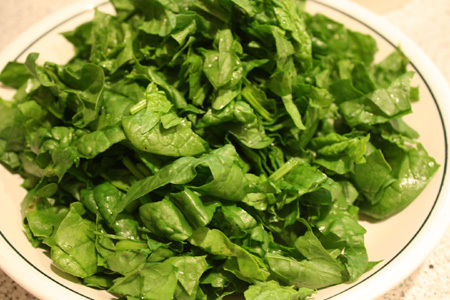 I often eat spinach raw in a salad, but it is a great addition to cooked dishes as long as you don’t overcook it into mush. So looking for something simple, I decided on a chicken recipe with spinach in a light white wine and lemon sauce. I’m chicken recipe oriented for a number of reasons. It’s healthy. It’s relatively inexpensive. It takes on flavors easily, being somewhat neutral, so it is a natural for when you want other ingredients to shine. While in the case of this dish the lemon and white wine come to the front of the stage, by barely wilting the spinach, it will retain its flavor and the chicken will provide the texture and the protein (you could possibly use tofu in this dish, but I would miss the depth of flavor that the chicken offers as it cooks). I have made this with and without chicken broth and haven’t really noticed much difference, other than the sauce can be a bit this if you use the broth. The chicken should offer enough flavor to make the broth unnecessary. This is very much a standard in my family as it is quickly prepared and cooked, and quite healthy too. I much prefer it to the many boring chicken dishes I am forced to make sometimes. 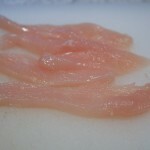 Grilled chicken is nice, but a little wine and lemon juice go a long way to take a boring chicken breast to new levels. Chicken recipes are a dime a dozen, and this is not an uncommon one, but this is the simplest version of this recipe I make, and it is worth the minimal effort to make it. 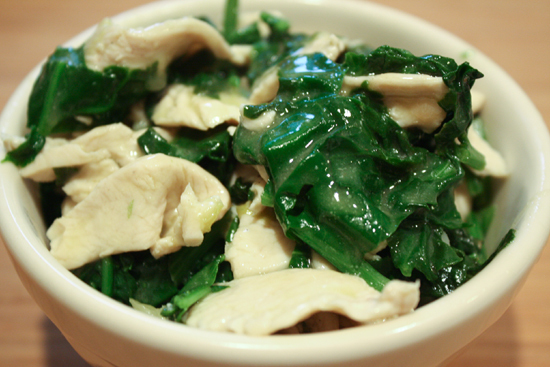 This chicken dish is packed with flavor and a great way to use up a lot of spinach, the mix of textures is fantastic. 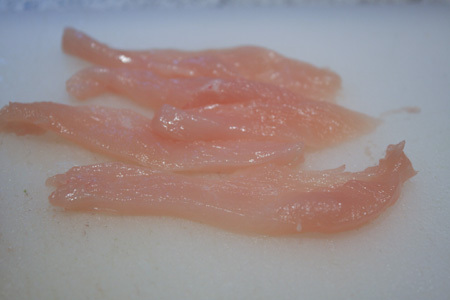 Slice the chicken into thin strips for fast cooking and a very tender consistency. Rinse the spinach and chop roughly. 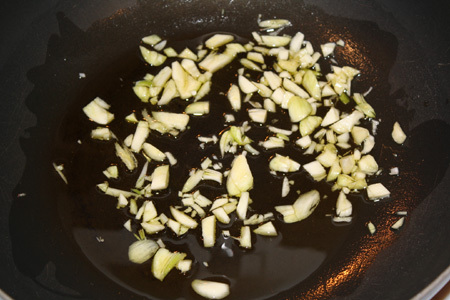 Heat olive oil in a pan and add add garlic. After a minute (before garlic browns) add the chicken and cook until just done. Add wine and lemon juice (and broth if you chose to, I often don't). 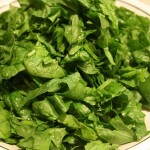 Toss in the spinach, and cook for just enough time for the leaves to wilt, but not overcook. If you find that the sauce is too thin, pour in a little corn starch dissolved in cold water and continue cooking for 30 seconds. You will find that the sauce thickens up nicely (this is the trick to all those thick sauces in Chinese restaurants, they often have corn starch dissolved in chicken broth ready for use, so you vegetarians our there may want to ask if they use broth or water for their corn starch thickener). This surprisingly delicious soup may sound odd to westerners, but the combination of peanut butter, tomatoes, and spices is truly a marvel of gastronomic achievement. Peanut is a definite presence in the soup, but is not the dominant flavor, which may sound impossible, but hey, would I lie to you? This is probably my favorite soup of all time. You can easily make a vegetarian version by using vegetable stock and it will be just as good. It is also so easy to make I force my 6 year old to make it for me as punishment for her misdeeds. She misbehaves a lot. 1. Bring the stock to a boil and add the all the ingredients except the chicken meat and peanut butter. 2. Simmer for about 30 minutes, allowing the sweet potato to soften, and then slowly add the peanut butter a bit at a time so that it melts well and into the soup. 3. 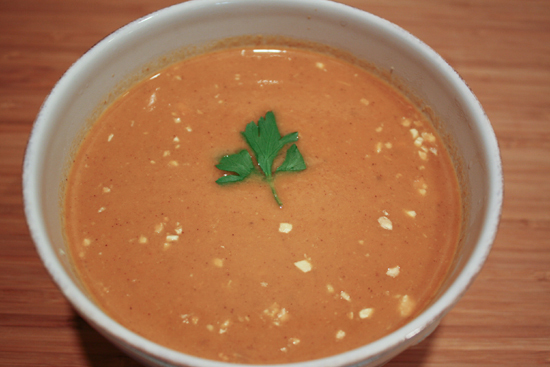 Puree the soup either with a hand blender, or by transferring the soup to a blender and processing it in batches. 4. 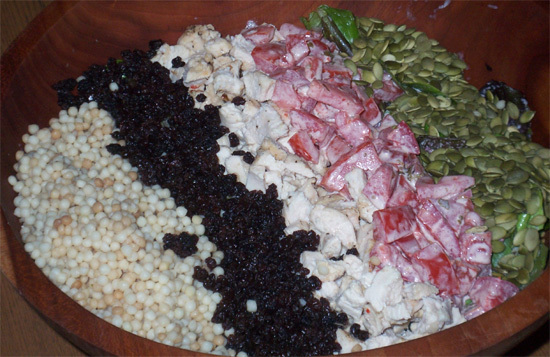 Return the pureed soup to the pot, add the chicken, salt and pepper, and serve. I prefer to make my own stock by putting a whole raw chicken or chicken pieces into a pot of water and boiling for an hour or so. You can then remove the meat and reserve it for later, and cook down the stock until you have about 4 cups. Also, this particular soup is very flexible. Change the amounts of different spices if you would like, I like a lot of cinnamon, which goes so well in this soup that it is astounding. The peanut butter is definitely present in this soup without it being cloying, though, but again, if you prefer more or less, experiment. I also tend to sprinkle a little crushed peanut onto the soup for a garnish when I’m taking a picture for this wildly popular blog, but don’t bother if I’m not serving to guests. This explosive salad hails from the depths of a friend’s brain. I believe she had it somewhere and made the recipe her own, but I can attest that, while the salad itself is tasty, the buttermilk pesto dressing is incredible enough to warrant drinking a glass of it as a nightcap. This is a great recipe for using leftover grilled chicken (which I have a lot of in the summer) and is a fairly light salad as well. Substituting ingredients is also encouraged, and there are lots of items that would go well with this dressing. That said, this is how we made it and it turned out better than I wanted (no need to get into that). Mix ingredients in a blender and chill. 1. Dress the salad greens and place them in a salad bowl. 2. Place the chopped items in the bowl, one at a time, in wide stripes. 3. Present the salad to your guests, and after the ‘oohs’ and ‘aahs’ toss the salad and serve. Wonderful for parties and oh, so easy. 1. Cook the whole chicken in 2 quarts water with 2 Tbsp. 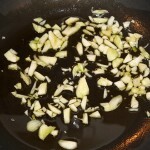 salt, and celery leaves until tender. 2. Cool in broth, remove meat from bones and cut into bite size pieces (reserve broth for the cream sauce). 3. Saute mushrooms	and combine with the cooked rice, sliced almonds, and finely chopped onion. 1. In a pan, melt the butter and add flour	and whisk together into a roux (paste). Add 3 cups chicken broth and whisk together. 2. To the broth mixture, add	4 c. grated cheddar	2 teaspoons salt and a dash of pepper. 3. Combine with chicken mixture and bake at 350 degrees F for 40 minutes or so until golden and bubbly. Don’t overcook or the sauce will separate. This classic, simple chicken dish is rich and flavorful while still being easy to make. 1. Lightly season each cutlet with salt and pepper. 2. Line up three plates — one with 1 cup flour, the 2nd with the egg , 1/8 tsp salt, and1/2 tsp olive oil mixed together, and the third with the mixed cheeses (Parmesan & Romano) and bread crumbs. 3. Take each cutlet, coat with flour, then egg mixture, then cheeses. Let rest on waxed paper for at least half an hour. 4. Saute the cutlets in butter (4 Tbsp) and olive oil (2Tbsp) for approximately 3 minutes on the first side and 2 minutes in second side, until brown and firm to the touch. 5. Keep warm in a low oven (150 degrees) until ready to serve. Put 4 Tbsp butter in a skillet over moderate heat until it turns light brown. Remove from heat and, add lemon and parsley. Spoon over cutlets and serve.